Physical Therapists use many different knee strengthening exercises during the rehab process. This page talks about an exercise that physical therapist often refer to as short arc quads or terminal knee extensions. When you have knee pain or suffer a knee injury, the muscles around your knee become weaker, but even after the injury is healed and the pain subsides, the muscles may not automatically return to their pre-injury strength. So it is important to re-train your muscles to work properly if you've experienced pain or injury. Chances are that you will limp and put more pressure on the right knee. But even when the pain is gone in the left knee you will likely still favor the other knee. This is one of the reasons re-injury is so common in any joint. The injury decreases the strength, flexibility, and efficiency of the joint, and if you don't work to restore those things the joint will be even more vulnerable in the future. Short Arc Quads are also called Terminal Knee Extensions. Short arc quads simply refers to using the quadriceps through a short arc range of motion. And terminal knee extension simply means that you are trying to strengthen your knee at the very end of the range of motion. The goal of this exercise is to strengthen the quadriceps in the last few inches of the range of motion. Having good strength at the end of the range of motion is so important for protecting and stabilizing the knee during walking, running, and jumping. 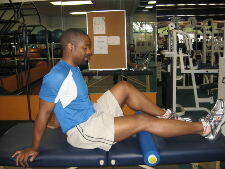 Below are pictures of this knee rehab exercise. Starting Position: Begin by sitting with your leg straight out in front of you. Place a rolled up towel, foam roller, or any other cylindrical object under your knee. Form: First flex your toes so that they move towards your shin. Then, straighten your knee as far as it can go. At the top of the range of motion, pause and really focus on squeezing (contracting) your quad muscles. Then, slowly return to the starting position. Personal Trainer Tips: It is important to focus on contracting the shin muscles and quad muscles during this exercise. When you tense up muscles it really helps to re-train the nervous system to turn on the muscles, and this is important for regaining strength. Perform 10-15 repetitions on each leg for 1-3 sets. Once you master this exercise with no weights you can progress by using ankle weights. Some ankle weights are adjustable and you can begin with 1/2 a pound and work up as you get stronger. Strong quadriceps are so important for knee stability, and it is important to work on strengthening the quads and knee at the end of the range of motion. In addition to short arc quads, quad sets (isometric quad squeezes), and straight leg raises are also great physical therapy knee strengthening exercises. These exercises can be good for many people suffering from slightly achy knees, but remember that you should see a professional if you are experiencing knee pain. Return to the Main Knee Strengthening Exercises Page from Short Arc Quads.